DaddyDaddyCool: Your kids are amazing... but, what are you doing about it ?? Welcome to the blog that promises to help you give your children a more fulfilling and memorable childhood. Your opinions and comments are important to me. Please feel free to share. Your kids are amazing... but, what are you doing about it ?? I only ask the question because sometimes I don't feel like I give my kids the credit they deserve for the things that they do. In the course of a busy week, the kids certainly feel that they've achieved things, had successes and "won" at whatever they were doing. As adults it's easy to miss the importance of these small achievements, and let large achievements fade into distant memory. Luckily in my kids' world, we have the top 3 levels nicely covered. 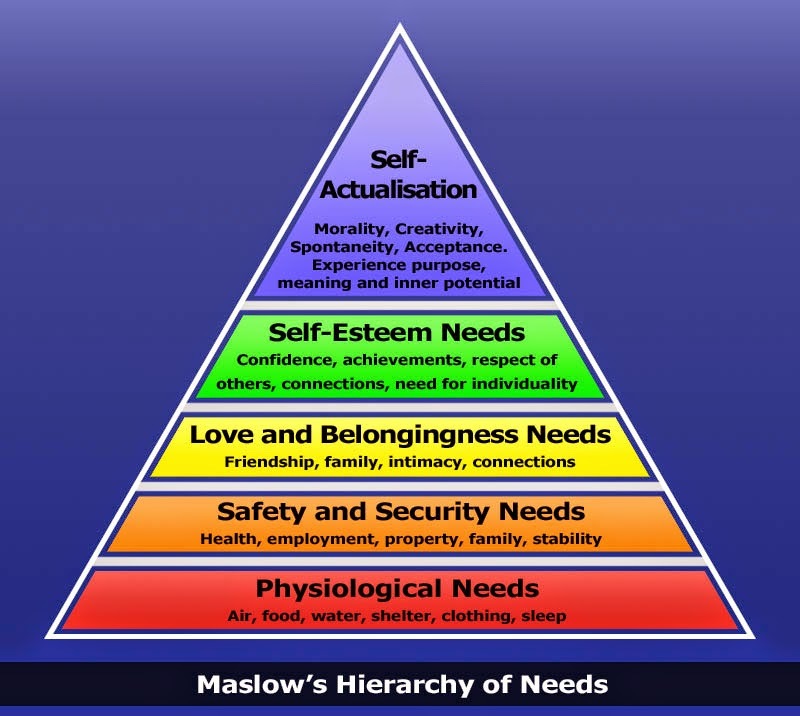 We still have to work hard to fulfill those needs, but our children are priviledged to not need to worry about levels 1 and 2. Level 3 is also present, whatever kind of family structure you have, the focus for most of us as parents is to make the children feel loved. So what else do they need? Well, level 4 seems to be our next goal. Building, in our children, self-respect, giving them recognition, and instilling self-confidence are the next most important needs. NOTE: "Being the best" is level 5 - not level 4. It's important to remember this. To address level 4, we should purposefully avoid merging our actions to try to meet level 5. Strict Level 4: "Well done Daisy, you were amazing! I was very proud of you. How did that feel?" Mixed Level 4 & 5: "Well done Charlie! You won! You've got a great chance of winning at the national championships!" The difference is simple. Recognise the children for what they have done, in that moment. Avoid projecting future success, or future potential into the picture. Adults sometimes have a difficulty in recognising different types of success. I was reminded of this when my youngest was struggling a little with his spelling tests. It was clear that he wasn't putting the work in, with enough attention to detail, and was going into the weekly test not 100% confident. We worked out a plan, which involved daily short sessions, with tests in the 2nd half of the week - so that he could see how well he knew the spellings well before the formal test. (GOOD) "Well done for sitting down and concentrating on your spellings!". The difference here is in recognising effort and attitude, not success. Success should come at the end of a lot of effort, so why wait until the success happens before you recognise and reward. And what do you do if a child fails, or doesn't win? "Well done for turning off your bedroom light this morning!" - in front of the other children who didn't. "I'm very impressed that you always get ready in good time for the bus!" - rather than being annoyed on the odd occasion when they forget their PE kit. "You're really getting into your maths today! You've been at it for 45 mins! Well done!" "You looked like you were trying really hard at training today - you were flying along!" "Thank you for being patient and not interupting. Now, what did you want to ask?" There is a song in the wonderful Theatre Show of 'Matilda', written by Tim Minchin, called 'My House'. A line in the song (and seeing the stage show) inspired this rather awesome tip. "On these walls I hang wonderful pictures"
Miss Honey sings this in her small, run-down shack of a house. In the stage show the pictures were drawings that the children in her class had drawn for her. I stole this and applied a little extra oomph to the sentiment. Most family houses have a pin board or a fridge with lovely kids drawings, newspaper cut-outs, and maybe a certificate or two. That's great, but I wanted to fill my house with motivation and memories. So we took it up a notch. I set the children a challenge at the beginning of the year to produce something worthy of framing and putting on the wall. We had a few empty picture hooks to fill up (a different story all together), and I wanted to put up something meaningful and beautiful. I could have gone over to IKEA and bought a random canvas picture of a pleasant photograph, like I did when we first moved in. But DaddyDaddyCool runs a different ship now! It took a little while, but the first picture that went up was a painting by my middle son. This was closely followed by a pen-drawing of Pudding Lane by my youngest. My eldest was a little stuck, as at secondary school their art was being done in an art book that couldn't be sliced apart until the end of term. But the next thing that I wanted to put on the wall wasn't art. My youngest got an unexpectedly good report from school and a special prize for science & technology. Guess what?... those went up on the wall, in a frame, too! Now everyday he walks past that picture frame with the glowing teacher comments in it. Knowing that I thought it deserved its place on the wall, and that I'd gone to the trouble of buying a frame, mounting it, and adding it to the collection. Extra bonus: frames are very cheap these days! I can't think of a better way to recognise his effort and his improved attitude to school! By the way, it makes me proud everytime I walk past it too! Just this morning, I framed up a special achievement certificate which my eldest received last year. There was a time delay because I was away when this event - the national maths challenge - happened. When I suggested that I frame another achievement certificate that she received as "Best in year 9", she objected and pointed out her more impressive former achievement. I conceded and we framed a 1 year old certificate which shows her as "Best in the country". I added a little extra 'Wow!' to this framing, to make it even more special. I'm secretly hoping for some more artwork to put up, as there are still a few bare walls around here. The positivity and motivation, that framed certificates and school reports give, can't be denied! So if you are looking for home decorating ideas, which are guaranteed to make you feel good, and will help tick off one of Maslow's higher-ranking needs for your children, then go ahead and start framing awesome stuff - DaddyDaddyCool style! Cruel or Kind ? You decide! Come dine with ... us!